The International Map of the World (also called the Millionth Map, after its scale of 1:1000000) was a project begun in 1913 to create a complete map of the world according to internationally agreed standards. Roads were depicted in red, towns and railways were depicted in black, and the labels were written in the Roman alphabet. 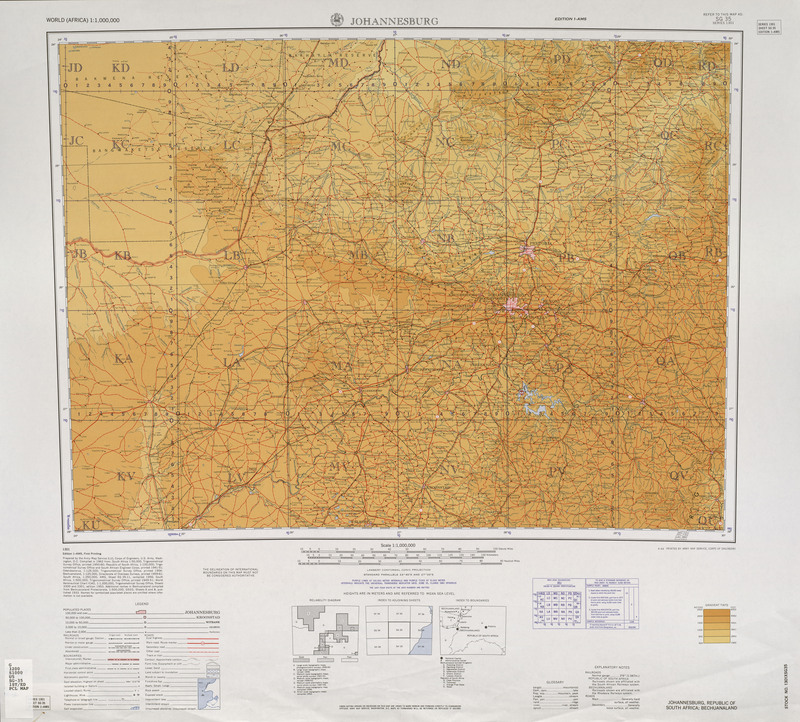 The map was the brainchild of Albrecht Penck, a German geographer who first proposed it in 1891. The Central Bureau of the Map of the World was established at the Ordnance Survey in London. After the Second World War, the United Nations took over the project. By 1953 only 400 of about 1000 sheets had been produced; though this covered most of the land surface outside North America, many sheets were decades out of date, and almost none of the open ocean was covered. 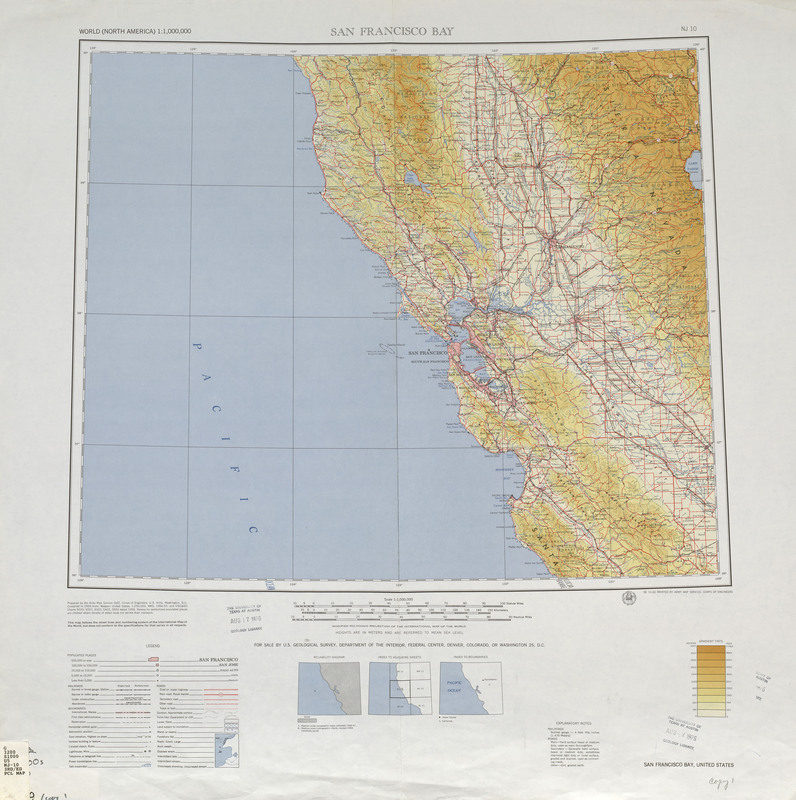 In 1964, Arthur H. Robinson dismissed the IMW as "cartographic wallpaper" of no practical use. There were few updates thereafter, and in 1989, UNESCO declared the project was no longer feasible and stopped monitoring it. Map index of northern and central Asia. Since it lies entirely north of the equator, prefix map index numbers with N.
Note longitudinal span increasing to 12° at 60°N, then to 24° at 76°N. Map NJ-10 covers 36°–40°N, 120°–126°W including San Francisco at 37°47′N 122°25′W﻿ / ﻿37.783°N 122.417°W﻿ / 37.783; -122.417. SG-35 covers 24°–28°S, 24°–30°E including Johannesburg at 26°12′S 28°03′E﻿ / ﻿26.200°S 28.050°E﻿ / -26.200; 28.050. NL-38(below, right) covers 44°–48°N, 48°–54°E including Astrakhan at 46°19′N 48°2′E﻿ / ﻿46.317°N 48.033°E﻿ / 46.317; 48.033. 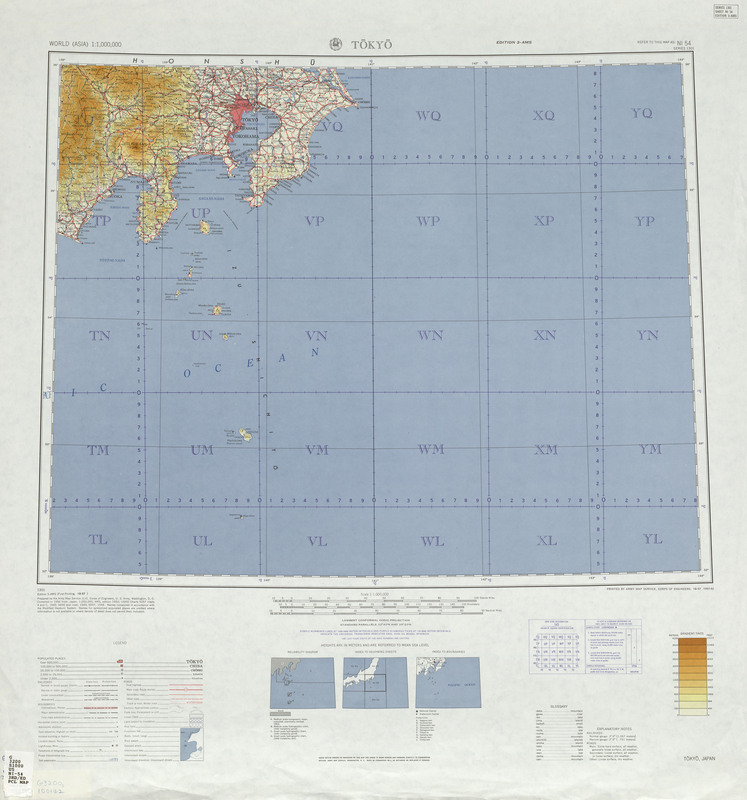 NI-54 covers 32°–36°N, 138°–144°E including Tokyo at 35°42′N 139°43′E﻿ / ﻿35.700°N 139.717°E﻿ / 35.700; 139.717. Due to shortening of longitudinal distances with increasing latitude, longitudinal span beyond 60 degrees latitude doubles to twelve degrees. Beyond 76 degrees it doubles again to 24 degrees. This indexing system outlived the international project and is still used in national and international mapping programs by Australia, Russia and the United States. Pearson, Alastair; Taylor, D. R. Fraser; Kline, Karen D.; Heffernan, Michael (2006). "Cartographic ideals and geopolitical realities: international maps of the world from the 1890s to the present". The Canadian Geographer. 50 (2): 149–176. doi:10.1111/j.0008-3658.2006.00133.x. ISSN 0008-3658. Pearson, Alastair W.; Heffernan, Michael (2 January 2015). "Globalizing Cartography? The International Map of the World, the International Geographical Union, and the United Nations". Imago Mundi. 67 (1): 58–80. doi:10.1080/03085694.2015.974956. ISSN 1479-7801. ^ Matt Rosenberg. "International Map of the World". About.com. Archived from the original on 2012-04-07. Retrieved 2010-05-08. ^ Great maps. [S.l. ]: Dk Publishing. 2014. p. 212. ISBN 978-1-4654-2463-1. ^ Robinson, A. H. (18 July 2013) . "The Future of the International Map". The Cartographic Journal. 2 (1): 23–26. doi:10.1179/caj.1965.2.1.23. ISSN 0008-7041. ^ "The International Map of the World and its Numbering System". Retrieved 2011-06-26. ^ NJ 10 San Francisco Bay (Map). 1:1 million. World (North America). U.S.A. Corps of Engineers. Army Map Service. 1962. Retrieved 2011-06-26 – via University of Texas Libraries. ^ SG 35 Johannesburg (Map). World (Africa). Army Map Service. c. 1962 – via University of Texas Libraries. ^ NI 54 Tokyo (Map). World (Asia). Army Map Service. 1957 – via University of Texas Libraries. ^ "Topographic Maps". Retrieved 2011-06-26. ^ "International Map of the World 1:1,000,000—List of map images in this collection:". University of Texas Libraries. University of Texas at Austin. Retrieved 2011-06-26. Wikimedia Commons has media related to International Map of the World.